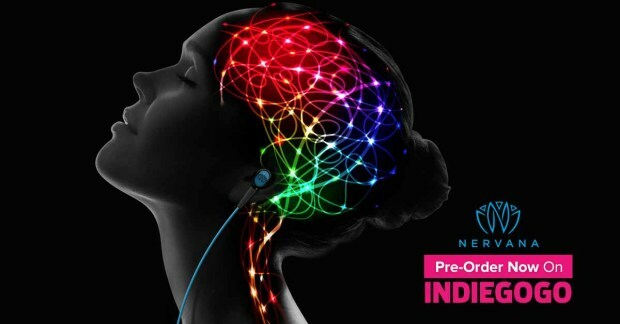 The only product of its kind, NERVANA debuted at CES earlier this year and generated industry and international buzz as one of the most highly anticipated wearable lifestyle products at CES 2016. In fact, NERVANA won the TechStars award for "Lifestyle and Digital Health" category at the 2016 Consumer Electronic Show (CES). NERVANA combines science and technology to make an ordinary experience extraordinary. It synchronizes nerve stimulation with sound, allowing the user to experience music in ways never felt before. NERVANA is a wearable product that sends a gentle electrical wave through the left ear canal to stimulate the body’s Vagus nerve, while syncing with music. This elicits a calm, relaxed feeling for most users in a natural way, which stimulates the brain’s pleasure center, known to release neurotransmitters (the body's feel-good messengers). In more technical terms....A central signal-processing circuit receives both music and stimulation signals and routes those signals appropriately to the two ear buds. 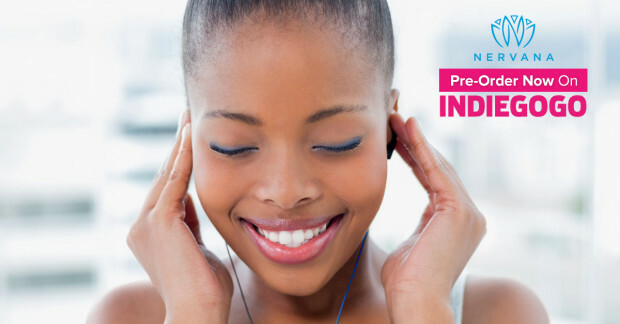 The right ear bud receives only the right channel of the music signal, which is output to a hand-picked, high-fidelity speaker in the right ear bud. The proprietary left ear bud, in comparison, not only receives the left channel of the music signal at its speaker, it also receives the stimulation signal within the ear bud material itself, to deliver electrical stimulation to the inside surface of the ear canal and, thereby, the Vagus nerve. The NERVANA Generator acts as a pass-through for a user-selected music signal, which is input through a standard audio jack and is output through the speakers contained within the ear buds of the NERVANA ear buds. Proprietary, patent-pending circuitry within the NERVANA Generator analyzes the music signal and generates a targeted Vagus nerve stimulation output that synchronizes with the music’s signal, so the user can Feel the Music. 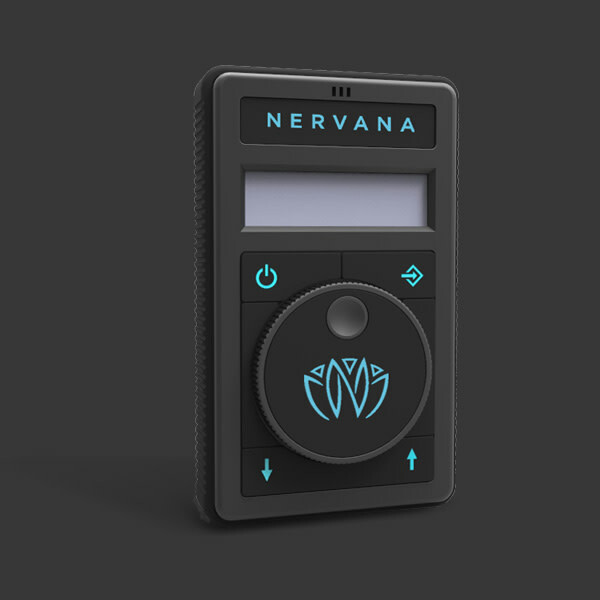 In contrast with Music Mode, Ambient Mode tasks the NERVANA Generator’s internal microphone with modulating output to the NERVANA ear buds based on sounds from the environment. 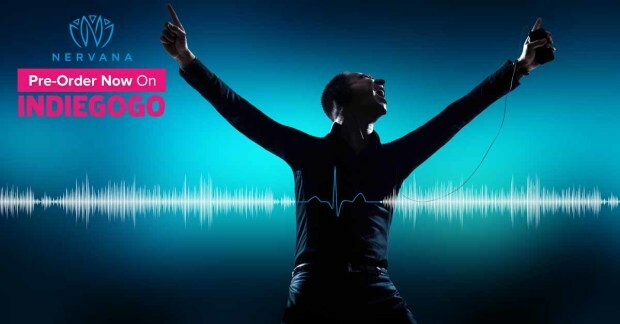 Put more simply, any music being played around the user, for example, at a concert, will be the basis for the Vagus nerve stimulation output sent to the user through the NERVANA ear buds. This means that, in the Ambient Mode, all NERVANA users in the same location can experience similar nerve stimulation. For users wanting to use NERVANA without music, there is a pre-defined nerve stimulation signal pattern that can be selected. Each mode can be easily customized with simple buttons to control the intensity level of the signal, ranging from 2 to 25, and a sensitivity dial. 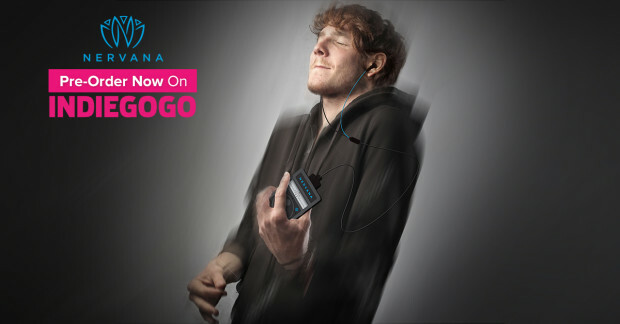 NERVANA is portable and compatible with all music players and it can be used virtually anywhere. The dual jack takes both output signals — from the NERVANA Generator and the music supply circuit (either from the user or from the environment) — and supplies them to various signal conduits within the lower portion of the NERVANA Ear Bud cord. 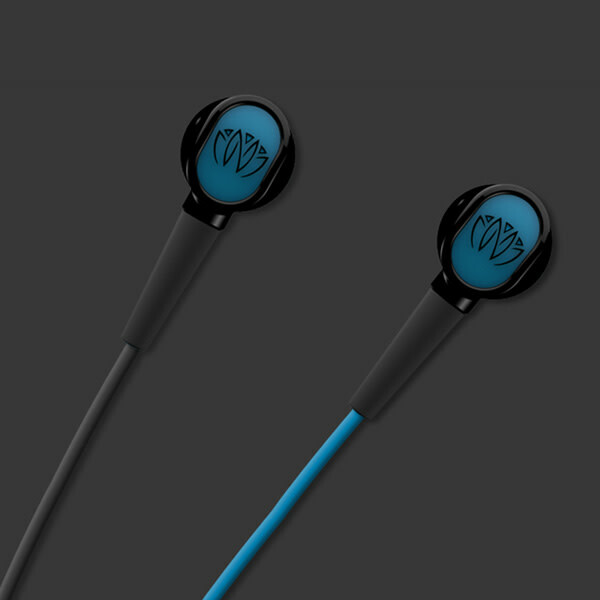 The NERVANA Ear Buds are unique and contain proprietary, patent-pending technology throughout. The entirety of the NERVANA ear buds were designed in-house and are made by our company using custom-designed molds and circuitry. Ear buds like these do not exist anywhere else. NERVANA was created by two brothers, Drs. Richard and Daniel Cartledge, both practicing physicians, who have been fascinated by Vagus nerve stimulation for decades. They had an idea to take the best part of vagus nerve stimulation and provide it to users in a way that was entirely non-invasive. In 2014, they formed NERVANA LLC, including medical and intellectual property experts and engineers to make that dream a reality. The team created NERVANA, a breakthrough product that accesses the Vagus nerve in a simple way and does so in harmony with tunes selected by the user. This is the first of many products NERVANA, LLC is planning to develop, with your support and contributions, that enhance our lives utilizing the exciting new science of bioelectronics. NERVANA is based in Boca Raton, FL.